Height: 84 in. Width: 30 in. Depth: 25 in. 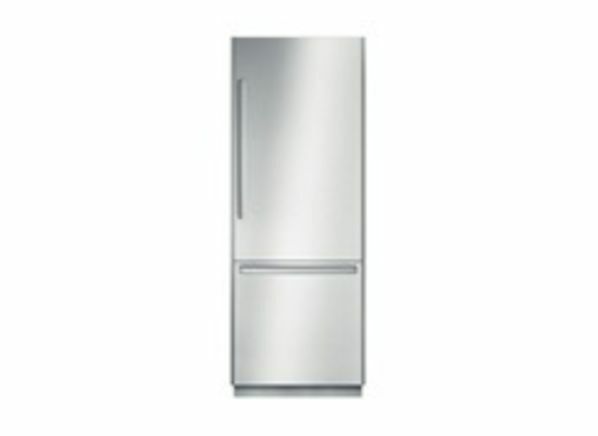 The Bosch Integra B30BB830SS is part of the Refrigerator test program at Consumer Reports. In our lab tests, Refrigerator models like the Integra B30BB830SS are rated on multiple criteria, such as those listed below. Owner satisfaction: Owner satisfaction icons are based on the proportion of members who are extremely likely to recommend their refrigerator to their friends and family. Thermostat control: This assesses the ability of the refrigerator's thermostat to 1) achieve the desired initial set temperatures following manufacturer's recommendations 2) achieve optimum temperatures in both the fresh food and freezer sections simultaneously and 3) keep internal temperatures constant despite large changes in room temperature. Results in the following chart are gathered from Consumer Reports’ 2018 Spring Survey of 2,597 built-in refrigerators, owned by members who purchased a new unit between 2008 and 2018. Our predicted reliability ratings are based on a statistical model that estimates problem rates within the first 5 years of ownership, for refrigerators that are not covered by an extended warranty or service contract. Higher ratings are indicative of better reliability. Brands receiving a red or orange rating cannot be recommended by CR at this time. Our owner satisfaction ratings are based on the proportion of members who are extremely likely to recommend their refrigerator to friends and family. Water dispenser Water dispenser It is normally located on the front of the unit, or in the fresh food compartment if it has an internal dispenser. Stainless/SS-look option Stainless/SS-look option Stainless steel is stylish but it shows fingerprints. Another option: a vinyl-covered metal finish that gives you a stainless-steel look but resists smudging. Uniquely adjustable shelves Uniquely adjustable shelves Shelves that can be moved up and down without removing food. An example is a shelf that adjusts by rotating a crank handle. Pullout shelves/bins Pullout shelves/bins These let you reach items in the back more easily. Some refrigerators have these features in both the freezer and main compartment. Half or split shelves Half or split shelves Half shelves, typically found on top-freezer or bottom-freezer models, can be set at the same height to provide a full-width shelf or can be set to different heights to improve storing flexibility. Split shelves, found on some side-by-sides, allow one side either to fold under the back half, fold up and out of the way, or move right to left. This leaves extra headroom for tall items. Gallon storage on door Gallon storage on door Door shelf can accommodate a standard one-gallon plastic milk container and makes for easier access to beverages. Temperature-controlled meat/deli bin Temperature-controlled meat/deli bin Keeps meat, fish, and cold cuts at around 32 degrees--several degrees colder than the rest of the fridge with a separate control. This feature generally does what it's supposed to, unless the thermostat in the main compartment is set too high. Icemaker Icemaker Typically makes 3 to 4 pounds of ice a day--but according to our repair data, an icemaker may also add reliability problems. Some higher-end models have a feature to speed ice-making, which produces as much as twice the amount in the same time. Built-in water filter Built-in water filter A water filter, included with many icemakers, is intended to reduce levels of lead, chlorine, and other impurities. A filter usually adds to the cost of the refrigerator, so have your tap water tested to see if you really need one. Change about every six months; filter-cartridge-replacement costs range from $30 to $40, plus shipping. Touchpad controls Touchpad controls In some models, you can use an electronic touchpad to adjust the temperature settings. In some higher-end models, the display will show the actual temperature. Spill guard on shelves Spill guard on shelves Raised border on glass sealed shelves prevents liquids from traveling. Child lock-out for dispenser Child lock-out for dispenser This feature, usually a button or switch, allows you to disable the ice and water dispensers. The icemaker continues to work while the dispensers are disabled. Freezer light Freezer light Available on most models. Spillproof shelves Spillproof shelves Shelf is designed to contain spills. Bottom-freezer Bottom-freezer These put frequently used items at eye level. Fairly wide refrigerator shelves provide easy access. Though you must bend to locate items in the freezer, even with models featuring a pull-out basket, you will probably do less bending overall because the refrigeration compartment is at eye level. Side-by-side Side-by-side Part of both the main compartment and the freezer are at eye level, where it's easy to reach. Side-by-sides are the most fully featured with through-the-door ice and water dispensers, temperature-controlled bins, and rapid ice-making cycles among the most requested. Narrow doors are handy in tight spaces. High, narrow compartments make finding stray items easy in front (harder in the back), but they may not hold items such as a sheet cake or a large turkey. Compared with top- and bottom-freezer models, a higher proportion of capacity goes to freezer space. They're much more expensive than similar-sized top-freezer models and are less space- and energy-efficient. French-door style French-door style French door models are bottom-freezer refrigerators whose upper compartments have two narrow doors that open similarly to the doors of a side-by-side refrigerator. These narrower doors use less space in front of the refrigerator when opened, and allow access to either or both sides of the full-width fresh-food compartment. Typically more expensive, French-door models are usually 36 inches wide, though some newer models are 33 inches wide. Exterior height (in.) Exterior height Our measurement, including the top hinge and rounded up to the nearest inch. (We measured only tested models, but the similar models we list should have the same dimensions.) Built-in models have the compressor on top, making them about a foot taller than regular refrigerators. They fit flush with cabinets and counters. Total usable capacity (cu. ft.) Total usable capacity Usable capacity is the volume, in cubic feet, of usable interior space, based on our measurements. We included ice-makers in the storage measurements for top-freezer and bottom-freezer models, but not for side-by-sides. Fridge usable capacity (cu. ft.) Fridge usable capacity Our measurement of usable volume. Freezer usable capacity (cu. ft.) Freezer usable capacity Our measurement of usable volume. Energy cost/yr. ($) Energy cost/yr. Estimated cost in dollars, based on the current year's average national electricity rate. Your cost will vary depending on the rate for electricity in your area. Energy star Energy star Refrigerators manufactured after April 28, 2008, earning this designation must be at least 20 percent more energy efficient than the minimum federal standard. Door style Door style While most fridges have a flat, textured "skin," some have a smooth, curved surface that can't accept custom panels. CR's suggested refrigerator setting CR's suggested refrigerator setting This is the refrigerator section controller setting, typically in degrees but sometimes a numeric value used for our 70 degree ambient temperature test to get the refrigerator center to be between 36 and 38 degrees. CR's suggested freezer setting CR's suggested freezer setting This is the freezer section controller setting, typically in degrees but sometimes a numeric value, used during our 70 degree ambient temperature tests to achieve a center temperature between -1 and 1 degrees. NA indicates that there is no separate freezer control. Ice/water dispenser Ice/water dispenser Through-the-door ice and water dispensers usually offer cubed or crushed ice and filtered water, but are only available on French-door models, with a special compartment in the fresh food section. They add significantly to the purchase price--and according to our repair data, may also add reliability problems.